This 25-acre park is sited to the north of the 319-acre Grant Park. 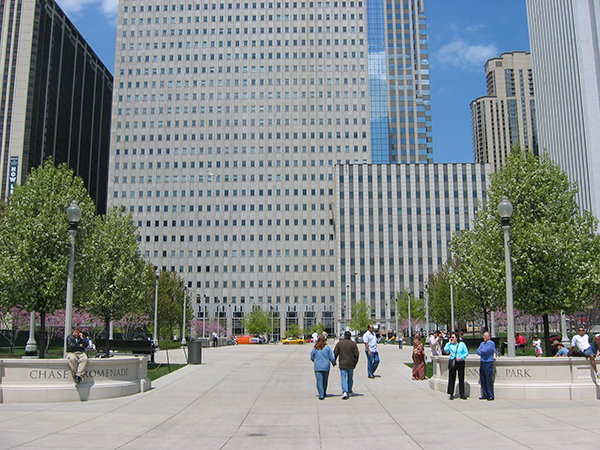 Between 1852 and 1997, the land that is now Millennium Park was cluttered with parking lots, railroads, and a station operated by the Illinois Central Railroad. 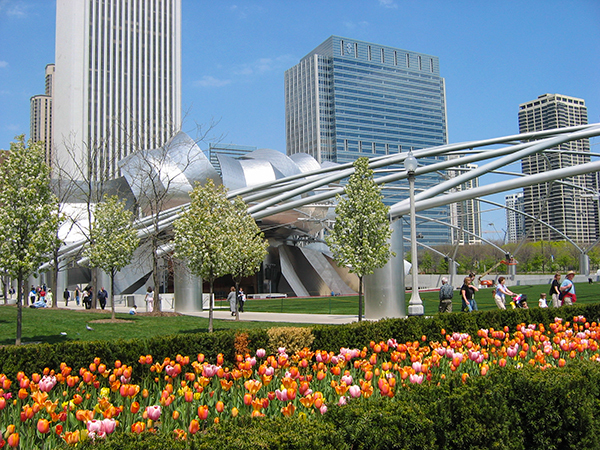 Mayor Richard M. Daley convinced the Railroad to donate its “air rights” to the City, and Skidmore, Owings & Merrill developed a master plan to construct a park atop subterranean parking and railroad infrastructure. Opened in 2004, the park includes a diversity of amenities laid out as an extension of Grant Park’s outdoor rooms defined by mature sycamore, honey locust, and maple. 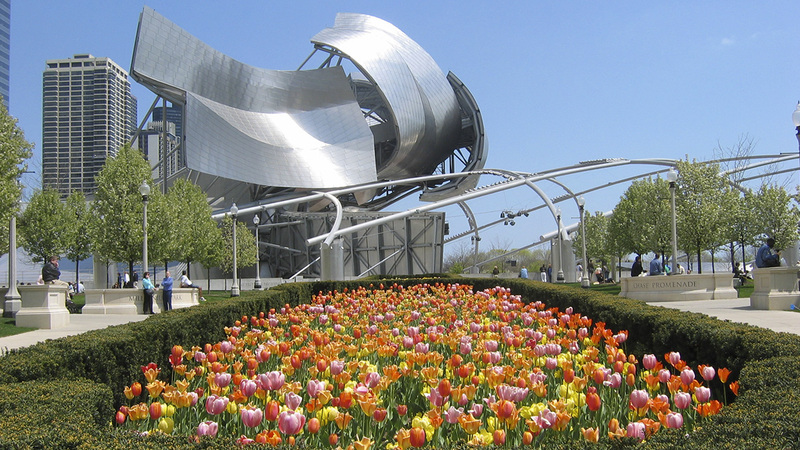 At the heart of the park, the Jay Pritzker Pavilion includes a 4,000 seat bandshell designed by Frank O. Gehry & Associates. 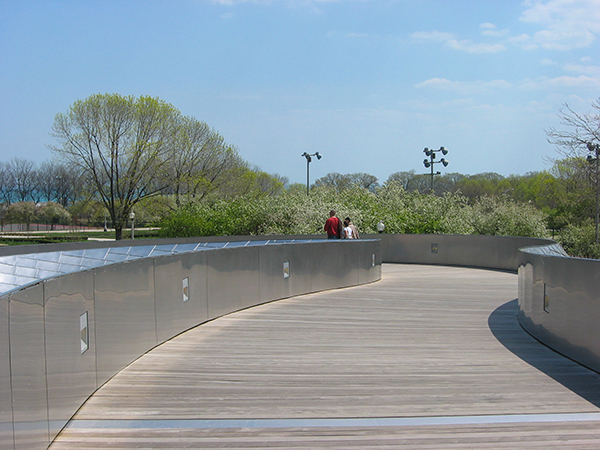 A serpentine pedestrian bridge, also designed by Gehry, connects Millennium Park to Maggie Daley Park. 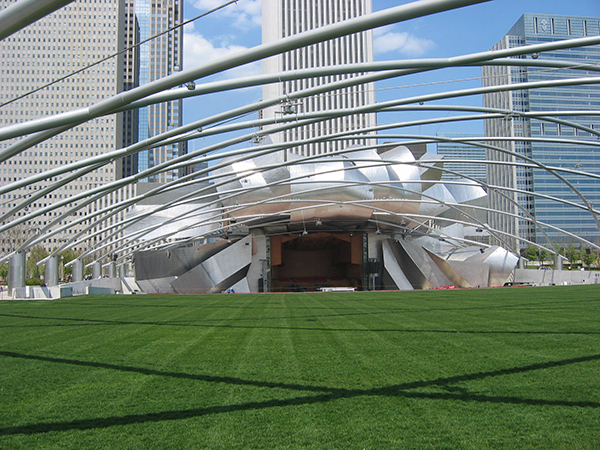 To the south of the Pavilion, the Great Lawn provides flexible space for 7,000 people. 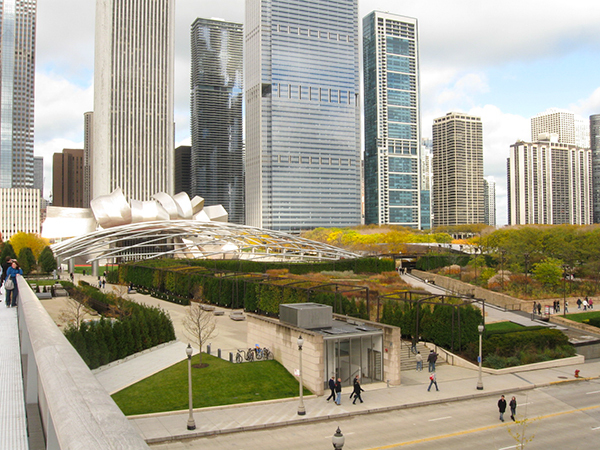 Beyond that, the five-acre Lurie Garden, designed by Gustafson Guthrie Nichol and Piet Oudolf, comprises a diverse and evolving collection of thematic plantings inspired by Midwestern ecotones. West of the Lurie Garden, the 620-foot-long Nichols Bridgeway, designed by Renzo Piano Building Workshop, spans Monroe Street to connect the park to the Chicago Art Institute. 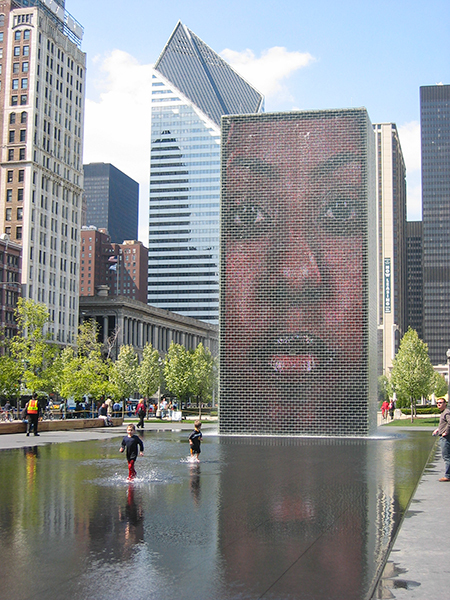 Nearby, the Crown Fountain is an interactive public art exhibit that features a black granite reflecting pool and two 50-foot towers that display videos of 1,000 faces spewing water through pursed lips. 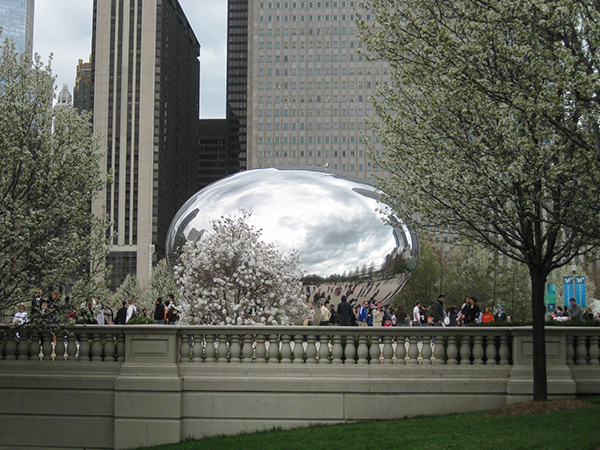 To the west of the Pavilion, the polished surface of Anish Kapoor’s Cloud Gate (“the Bean”) reflects the surrounding city. The eight-acre Beaux-Arts Chase Promenade provides outdoor exhibit space and connects two outdoor galleries. 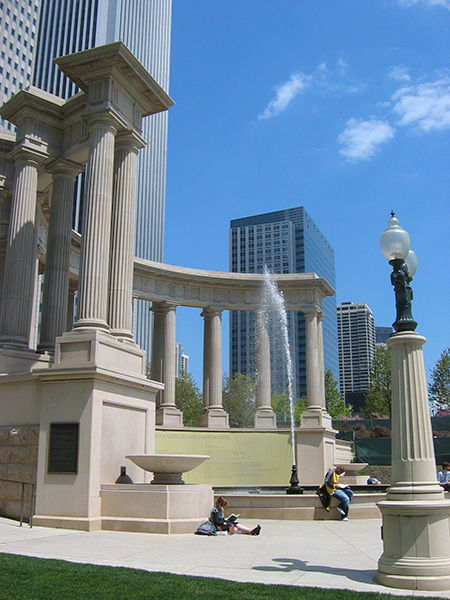 In the northwest corner of Millennium Park, Wrigley Square comprises a lawn, a fountain, and a replica of the peristyle that stood in Grant Park between 1917 and 1953.